Professional Surveillance System or Cloud Based Security Camera? You have been researching which product in the vast and complicated surveillance camera market is going to work for you. If you have tried a Nest cam or other “cloud camera” products, you have realized that video recording with cloud cameras is dependent on your internet speed and the recurring fees add up quickly. Security cameras that record to the cloud sound great but are highly impractical for the budget conscious customer. It doesn’t make sense to buy a camera and then pay monthly fees to record each camera. A professional camera system allows the home or business owner to pick and choose the best security cameras for his/her use and take advantage of camera resolutions up to UltraHD 4K. Home consumer products like cloud based cameras fail to offer 4K resolutions with fluid video recording. A professional HD security camera system uses a central recording unit called a Digital Video Recorder (DVR) or Network Video Recorder (NVR) that stores all the footage for cameras wired to it without any monthly recurring costs. Professional systems may sound intimidating at first, but are simpler once you familiarize yourself with the jargon of the security camera industry. The hardest part to putting together your own surveillance system is the physical installation of the cameras and running the wire. If that is too difficult then easily outsource that work to a handyman or local IT company familiar with the process and begin enjoying your newfound security. To choose the best security cameras for yourself it is important to ask yourself why you need cameras and what you intend to watch with them. The security camera industry jargon is best learned in practice when asking yourself these questions, so let's begin. How far do you want to see? When looking for cameras, it is important to know what is the exact reason you need them. Are you looking to view at night, in the day, or both? During the day, cameras function similarly to the human eye, but a camera’s resolution limits the distance a camera can view. In darkness, cameras view about 5-10 ft less than they can view during the day. For example, if a camera can see a face up to 40ft away during the day, it will see a face clearly about 30-35ft at night. Remember, the picture you see at night will usually not be color, but a black and white video. This is because of the camera’s night vision provided by its infrared LEDs that allow it to see in dark conditions. Infrared LEDs around the camera’s lens illuminate the area the camera is pointed at with light that only the camera can see, and a human cannot. All humans see is a faint glow around the camera as shown to the right. 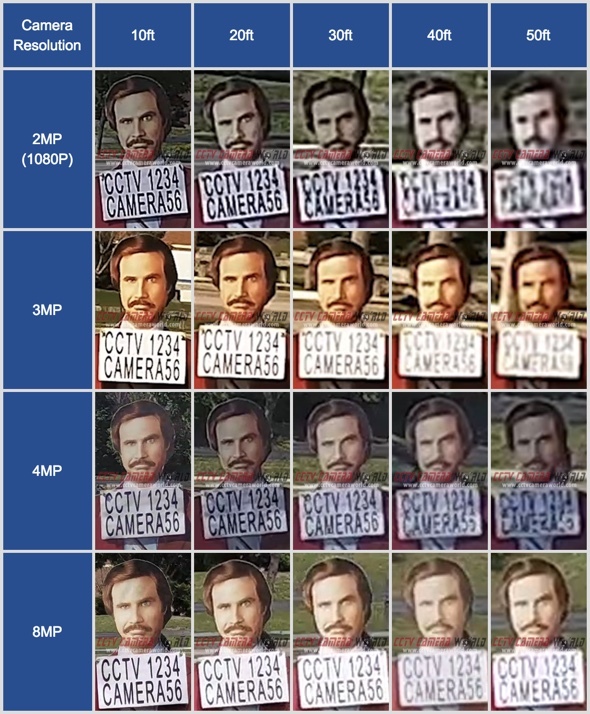 At CCTV Camera World we have developed the below infographic security camera resolution comparison to illustrate the varying degree of clarity provided by different camera resolutions. It is important to note that our security cameras are manufactured with high quality sensors that are true to spec, unlike inexpensive cameras available on your favorite marketplace (named after a tropical rainforest) that use low quality sensors to provide interpolated images. The camera matrix should only be used as a guide for picture quality offered by reputable companies, while cheaper low-end cameras will not match this performance. As you can see from the camera matrix above, the amount of facial detail you get depends on the resolution of the camera, which is measured in megapixels (MP). Megapixels is a way to quantify the resolution of the camera. The higher the megapixels, the greater the number of pixels captured by the camera. For example, if you compare the video quality of 2MP vs 4MP, you will find the latter captures twice the detail; that's why you can digitally zoom in and see a face up to 40ft away with a 4MP security camera, while the 2MP camera can only provide facial detail up to 20ft, i.e. half that distance of a 4MP. So ask yourself, how far do you want to identify facial detail with each camera? Using the matrix is an easy way to understand the role resolution plays in picture clarity in order to recognize faces at varying distances while the camera maintains a standard viewing angle of around 84 degrees provided by either a 3.6mm or 4mm lens. Be sure to plan your expectations for facial identification before purchasing your security camera system. For example, a 2MP or 3MP camera will suffice in an office environment where you don’t need facial detail more than 20-30ft away from the camera. On the other hand, a warehouse with 20ft ceilings will require a camera that has over 40ft of facial recognition in order to properly identify a perpetrator, or when reporting a work-related injury. Digital zoom allows a user to digitally magnify an image. The video below illustrates the concept of digital zoom to see a face 40ft away with a 4MP security camera. Zoom in too far and the video picture will begin to appear fuzzy and distorted because the amount of digital zoom is limited by the picture’s resolution. Camera resolution determines the resolution of the picture. It is similar to digitally zooming in on a photo taken with your cell phone camera. It is important to understand the digital zoom is not limitless. Once you’ve taken a picture and zoomed in far enough, the picture becomes pixelated. The better the resolution of the camera on your phone, the more digital zoom capability it has to zoom in before pixelation of the image becomes a problem. Properly knowing the environment you wish to place your cameras will better equip you with the knowledge needed in choosing a surveillance camera that offers a quality picture without breaking the bank. Remember that facial detail will be 5-10ft less during the night. Besides resolution, how far a camera can see is determined by its lens, and by the amount of infrared night vision. Most security cameras come standard with a fixed viewing angle that is about 83 degrees because they have a fixed lens. This means the camera maintains the same field of view and the picture can only be digitally magnified. Most of the time, you can use a fixed lens camera and mount it close to the area that needs surveillance while making sure the camera has lots of resolution so you can use digital zoom to see more detail. As we see in the camera matrix above, even 12MP cameras are limited to 70ft of facial detail at a wide viewing angle. It is important to understand that there is no camera that can see the width of your front lawn and provide enough detail to identify a face 80ft away for prosecution. It is just not possible . . . yet! For scenarios where you need to identify a face more than 70ft away, a camera with a zoom lens will be needed. The concepts of zoom and lens are intertwined with one another. To understand what type of lens your camera should have, you must know the distinction between Digital Zoom and Optical Zoom. Fixed lens cameras cannot do optical zoom because the lens is not moveable. Cameras with optical zoom are commonly referred to as varifocal cameras. The optical zoom feature has the capability of zooming in on live video feeds by adjusting the lens without sacrificing clarity, exactly like a pair of binoculars let you see objects at a distance. Optical zoom lenses are either manual varifocal or motorized varifocal. A manual varifocal zoom lens will need to be adjusted with an allen key in order to zoom in. A motorized zoom lens can be controlled from an NVR, smart phone, or computer to zoom in while viewing live video feeds. Still, optical zoom has its limitations. When zooming in, your field of view will shrink towards the center of the picture. Let's use an example to better understand optical zoom. The video example below shows a comparison of both digital zoom and optical zoom in a real-world application. The license plates on the cars are 50ft away from the camera. The image begins with the digital zoom windows showing that the license plate on the vehicle is barely readable. The numbers on the plates are blurry because the 4MP security camera is set to a 3.6mm lens setting to provide a 80 degree angle of view. While watching the camera in live-view, we toggle the camera's zoom lens to full power. At full optical zoom, the license plates are clearly readable as shown in the digital zoom windows. Without the 3.6 -12mm optical zoom lens on the camera, it would be impossible for us to see the license plates. It is important to note, that as we zoom-in the field of view decreases, i.e. we can no longer see the same number of parking spaces as we did when zoomed-out at the beginning. How far a camera can see at night is determined by the night vision the security camera has to offer. Professional surveillance cameras are usually manufactured with the ability to see general detail in darkness farther than the camera’s ability to identify a face. For example, 4MP security cameras with an 80 degree angle of view can see a face up to 35ft in darkness, but they usually come with night vision capable of 100ft to see if there is someone trespassing at a distance. When choosing a security camera it is important to pick the right amount of infrared night vision for the application and remember that night vision distance doesn't mean facial identification distance. 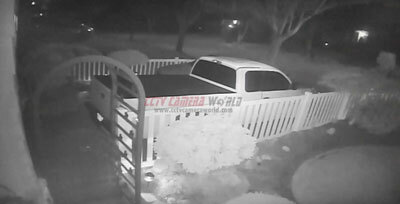 In addition to choosing the right amount of night vision a camera has, it is important to understand good practices for night vision security cameras. Most cameras these days employ Smart IR to reduce the intensity of infrared (IR) light being emitted from the camera when an object in-focus is up close. This is done to minimize over-exposure where the object would look completely white as a result of too much IR light. 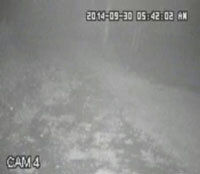 The image below is an example of Smart IR functioning on a camera with 300ft of infrared night vision. While the truck is only 30ft away from the camera, the Smart IR feature reduces IR intensity to prevent “IR glare” on objects close to the camera. Specifically, the fence and bush on the side of the truck facing the camera are the main objects in focus. SmartIR reduces intensity to ensure that those objects do not become over-exposed with IR glare. While this is great, the other side of the truck will not get the same amount of night vision. It is important to understand that night vision security cameras cannot be placed behind a window or any type of glass. Otherwise the IR light from the camera will reflect from the window back in to the camera’s sensor, causing IR reflection (see image to right). Although mounting a surveillance camera on the exterior of a home may sound like a daunting task, it is the only way for a camera to perform the way it was designed. Which type of security camera technology is right for you? Are you looking for resolutions higher than 4K? Are you reusing existing cabling to upgrade? Are your cable runs over 300ft? To be able to answer these questions, let's delve into more detail to learn about HD over Coax Cameras and IP cameras. HD Security Cameras are the replacement technology for older CCTV cameras which use coax cabling to send a video signal. CCTV cameras have been in use since the 1970s, and there are plenty of homes and businesses that have existing coax cabling. To reduce the cost of upgrading to a HD security system, the surveillance camera industry developed HD over Coax Cameras to allow video resolutions up to 4K to be transmitted over existing coax cabling infrastructure. The picture to the right shows the different forms of coax cabling for you to compare if you have existing cabling that looks the same. It is important to note that good quality coaxial wire is required as discussed later in this guide. HDCVI Cameras - available in resolutions up to 4K, and transmit video / audio / PTZ controls over the coax cable using HDCVI signal technology that is compatible with all of our DVRs. 4-in-1 Security Cameras - output four signal types: HDCVI, HDTVI, AHD, and Analog (CVBS). For compatibility with other systems on the market, 4-in-1 cameras can be switched to the desired signal type. HDTVI and AHD are signal types used in some low-cost camera kits sold at big box stores. 4in1 security cameras are available in resolutions up to 2K, and transmit video / PTZ controls over coax when in HDCVI, HDTVI, or AHD mode. They can also be used in CVBS mode with older equipment or TVs that only accept analog resolution video signals to provide a non-HD picture as discussed in this review of 4 in 1 security cameras. Like older CCTV cameras, HD over Coax Cameras use siamese security camera cables to send video and power. With good quality solid copper coax from a roll, HDCVI cameras can transmit video up to 1600ft. 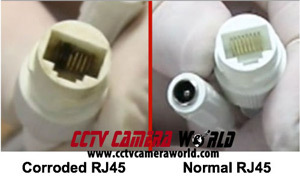 The picture below shows how RG59U siamese security camera wire from a roll is terminated to connect to a camera. Once the cabling is in place, setup is fairly easy since it is plug and play from this point as shown in the video below on how to setup a security camera system consisting of coax cameras. IP Cameras are network based security cameras that communicate over a computer network to send a data signal back to the recorder. The data signal may consist of video, audio, PTZ controls, and video analytics metadata depending on the model of the cameras. They use network cabling such as CAT5e or CAT6 to transmit data and power using Power over Ethernet (PoE) technology, which simplifies the wiring infrastructure since network cabling is now common. Since there is a lot of bandwidth available over network cabling, IP cameras can support resolutions even higher than 4K, surpassing HD security cameras. While IP cameras do have the benefits of PoE technology simplifying cabling and power to the cameras, and support for almost limitless resolutions in the future, they do have one limitation. One limitation common to all IP cameras is that the longest distance a network cable can be run is 100 meters. For wire runs longer than 100m, a PoE extender is required to extend the data signal by using some of the amperage from the PoE signal, which eats up some of the power available to the camera. Therefore, cameras with high wattage requirements (greater than 12 Watts) cannot use PoE in wire runs over 100m due to power degradation as a result of the PoE extender. New technologies like extended PoE technology in some of our network cameras allow for wire lengths up to 300m, however it is limited to low wattage cameras like fixed lens cameras which require less than 12W. As long as the wiring limitation is taken into account, an IP camera system is easy to setup either over an existing computer network, or as a self-contained system with a PoE NVR. While setup over the network can be a daunting task if you're unfamiliar with computer networking concepts, IP camera systems with plug-and-play cameras and PoE NVR are easy to setup even for the most novice user. Since such systems have a PoE NVR at the heart of the system to tie in everything together, they are also called NVR camera systems. As shown in the video below, setup of CCTV Camera World's IP camera systems consisting of up to 16 cameras is simple. Our NVRs are able to detect the presence of compatible cameras we sell, and configure them on an internal network inside the NVR without needing user intervention. This allows for a plug-and-play PoE IP camera system that anyone can setup. If you have existing CAT5e or CAT6 wire in your building, then IP cameras are a sensible choice. However, if you have existing coax cabling and are debating whether to redo the cabling to support IP cameras, the only reason to take on such an expense would be if you need resolutions higher than 4K on all of your security cameras. Otherwise, we recommend reusing existing coax cabling and using our HD security cameras over coax. Regardless of which camera signal type you purchase, the rest of this guide discusses the questions you should ask yourself to choose the best security cameras for your home or business. What is the reason you need cameras? Is it for safety or theft? Having security footage with time lapsed or jumpy video is a common complaint of many. The picture may look jumpy because it was recorded at low frames per second (fps). Surveillance cameras from 2013 and earlier were commonly recorded at 7fps due to either limitations of the security camera recorder’s processing power or lack of storage space. This would result in recorded footage failing to capture fast moving action such as an armed robbery. Today, cameras commonly function between 15fps and 30fps. Cameras that are capable of 30fps are generally used for license plates capturing or when overlooking a cash register with one of our motorized zoom security cameras where there is fast paced exchange of currency. For low traffic areas, we suggest recording at 15fps to conserve storage space while recording at HD or higher resolution. For important areas prone to fast paced motion, we suggest 30fps video recording. The video below illustrates the difference between video recorded at different rates, ranging from 30 to 3 fps. Where are you mounting security cameras? The eaves under a roof is a frequent cause of IR reflection. Even if the eaves itself is not in the view of the camera, if your camera's lens is close to parallel with the eaves, the camera will have IR reflection. Check to see if other lighting will be around your camera such as garage lights or street lights. Reflection from those lights can potentially affect the camera’s picture. Do not place your camera behind a window. This will produce a glare when a camera switches to night vision mode; the infrared LEDs will reflect back into the camera. Do not install cameras facing one another. The cameras' IR LEDs will shine into each other affecting their video in darkness. Do not stick a camera out from under the eaves. This will lead to potential weather damage such as rain, snow, or ice pouring and accumulating on the camera. Make sure your camera is out of reach of passersby so it cannot be tampered with. If the camera must be within reach of anyone, please consider using our vandal resistant and impact resistant cameras. Be aware of insect swarms. Insects tend to swarm around cameras with IR LEDs. Expect to be cleaning your camera once in a while to avoid obstruction of spiders, moths, or flies. If you are looking at a camera that can see license plates in day and night, be mindful that it has strict requirements about placement. The vehicles must pass in a path that is no more than 15 degrees away from the lens in the license plate security camera. Also be careful to place it in an area where it cannot be run into. Is a bullet, dome, or PTZ security camera best for you? After you have decided on the location of the camera is when you can choose camera style. There are multiple surveillance camera styles to choose from. Here are examples and explanations as to which camera is best for the system you are planning. A Bullet Camera is easy to install, and there is no need to open the camera when mounting it. There are also no wires for a vandal to cut since the wires feed through the bracket of the camera and won’t be visible if mounted properly. It is effortless to manually adjust the camera’s direction after installation thanks to the 3-axis bracket on most bullet security cameras. The viewing adaptability makes it ideal for outdoor usage and viewing at long distances. Compared to dome cameras, bullet cameras are available with higher power optical zoom and night vision. Dome cameras require more effort when installing but have a discreet design, making them ideal for installation in a restaurant or home. The dome shape makes it difficult to tell which direction the camera is facing. When installing, the camera must be opened in order to properly mount the camera. Although one may presume that domes are usually placed indoors, in fact most of our dome cameras are weather resistant, and also vandal resistant. If properly mounted the wires will be hidden. Dome cameras are difficult to remove once mounted. Among fixed lens cameras, dome security cameras are usually available with wide angle lenses to provide a greater field of view. If you are looking for a discreet security camera, especially for a home, then a dome camera is your ideal choice. Further, it is a misconception that a bullet or dome camera is better for outdoor use. It all depends on the weather rating of the camera itself. Turret cameras, also called eyeball cameras, provide the best of dome and bullet cameras. When mounting, the eyeball can be positioned in virtually any angle like a bullet camera, while being vandal resistant and small in size like a dome. Look into a turret camera if you would like to have an inconspicuous and vandal resistant camera with the flexibility of angling the camera in any direction like a bullet camera. The live video feed from a PTZ camera can be adjusted by panning, tilting, and zooming. This can be done by a joystick controller, NVR, or even a smartphone. PTZ cameras cost more than any other type but have more capabilities. PTZ cameras can be put into tour mode which effectively allows the security camera to follow a preset patrolling path. Some PTZ camera models have the ability to auto track what enters a predefined intrusion detection area. Look into a PTZ camera if you want to actively monitor the live-video feed from a large area while still being able to zoom in and see great detail, as in the case of a security guard overlooking a parking lot. What type of wiring to use? The wiring you wish to put in place depends on whether you already have a security camera system or the type of cameras you would like to choose. The two common types of cables used for installation of security camera systems are RG59U and network cables. RG59U is a coax cable designed for Analog or HD security cameras over coax. Network cabling such as CAT5e or CAT6 is commonly used for IP cameras, although it can be adapted with a special adaptor called video balun to use with HD-over-coax cameras. Both kinds of wiring are available as a large roll or pre-made wire with tips already installed. HD-over-coax cameras such as HDCVI and 4-in-1 cameras are cost effective and can transmit a video signal over a longer distance compared to network surveillance cameras. We recommend HDCVI cameras or 4-in-1 cameras because they allow the user to send a signal up to 1600ft. HDCVI cameras that we carry can send video, audio and PTZ data controls over a single coax conductor found in RG59U wiring. IP cameras of the PoE type can send video, audio, and PTZ controls as a data signal, which allows for transmission up to 300ft unless a PoE extender is used to repeat the data signal. However, there are exceptions to this such as a select number of cameras with extended PoE technology that are using proprietary methods to send a PoE signal to a low power consumption camera up to 980ft. Siamese Cable for HD over Coax cameras is usually weather resistant. RG59U siamese coax wire that comes as a spool or roll is weather resistant, meaning it can withstand UV light and non-pooling water. A second type of cable called "premade siamese cable" is prefabricated wire that is commonly used for easy installation by home consumers and small businesses. The weather resistance of such wire varies depending on the quality of the wire. The premade siamese cable we carry is weather resistant. Network Cable that is used for IP surveillance systems is only indoor rated and not recommended for outdoor use unless enclosed in a conduit. While weather resistant CAT5e and CAT6 network cabling is available, it is very expensive. Depending on how much wire will actually be exposed to direct sunlight and moisture, you have to choose whether it is more economical to protect the cable with a conduit or purchase a weather resistant cable. Regardless of whether you use coaxial or network cable, it is important to understand that all wire is not created equal. It is easy to find inexpensive cable of either type and not understand the difference between it and higher cost wire. The best quality wire has a Full Copper (aka solid copper) conductor and transmits a signal the farthest since copper is the best conductor among the other variants. Lower quality wire is copper clad, meaning there is copper only along the circumference of the wire while the core of the wire is composed of an alloy mix such as Aluminum. The latter is called Copper Clad Aluminum (CCA), and is lower cost wire available at bargain prices. CCA wire is suitable for short wire runs while Full Copper wire is required for long runs. With HD-over-coax cameras, RG59U coax wire of the CCA type can be used for runs up to 300ft with satisfactory results. With PoE IP cameras, CAT5e or CAT6 wire of the CCA type can be used for wire runs up to 150ft. For longer wire runs, Full Copper wire is key to maintain a good signal. With Full Copper RG59U coaxial cable HDCVI cameras can reach distances up to 1600ft, and with Full Copper CAT5e or CAT6 cable IP cameras can be run up to 328ft before needing a PoE extender. If you are using cable from a roll and terminating the ends yourself, it is a good idea to invest in a cable continuity tester. Although it may seem like it's one more thing to buy, a cable continuity tester can save a lot of time you would otherwise waste troubleshooting why your cameras are not working. 90% of the time, we find poor cable terminations to be the culprit when a newly installed camera is not working properly. It is of utmost importance that the cable ends connecting in to the camera be properly enclosed and protected from the elements. 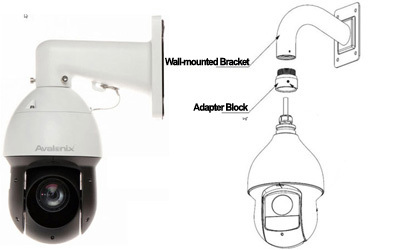 IP cameras come with weather proof cable glands to protect the camera's pigtail from corrosion. BNC camera ends can be enclosed in a junction box or with weatherproof electrical tape to cover the cable ends. If the pigtail on a camera is left dangling unprotected in the elements, it will corrode due to moisture in the air and render your camera inoperable; such damage is not covered by any limited warranty as it falls under improper installation technique. How to record security cameras? There are a few different ways to record and save video from a security camera as explained below. Only some IP cameras accommodate an internal microSD card. While inexpensive, a microSD card has a limited amount of storage ranging from 64gb to 128gb depending on the model of the camera, which would provide a maximum of 2 days of continuous video storage. If you are looking for motion activated video recording for a couple of days, or still picture recording, then a camera with an internal memory card will suffice. You can find security cameras with SD card recording capabilities here. 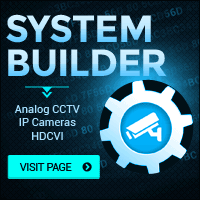 There are several software packages available on the internet that allow a variety of security cameras to be recorded to a computer. It may sound like a great idea to leave your computer on and record cameras to a PC, saving money by not having to purchase another device. However, when the computer hangs for an unknown reason or is interrupted by a Windows update, there is a chance of failure that at the wrong time can be costly and disappointing. Professional software packages offering functions like video analytics are very expensive due to their licensing structure, and require dedicated multicore computers to function. When you factor in the cost of the software, and reliable hardware, a standalone Linux based security video recorder would be more economical and functional. Distribution of Labor was the fundamental principle behind the success of the Industrial Revolution. That same principle is being applied to computing devices where dedicated appliances manage specific tasks, and manage them reliably. It is time- and cost-effective to use a dedicated recorder for storing important security footage, and allow easy video playback. To fulfill this need for HD security cameras over coax and IP cameras, a DVR and NVR were created. DVR - a Digital Video Recorder takes an analog video signal and encodes it digitally to save to a hard drive inside itself. DVRs used to be specifically for security cameras that sent a signal over a BNC terminated cable such as coax or over a network cable using balun connectors. Since 2013, DVRs have accommodated not only traditional analog resolution CCTV cameras but also HD security cameras that send video over coax. Each year new DVR models have supported higher resolution video over coax than the year before. At this time DVRs can support up to 4K video over coax. Unlike PoE NVRs that offer integrated PoE ports for a plug-and-play connection with an IP camera, DVR and XVR recorders have only one network port and require a PoE switch connected to the same network to power and communicate with IP security cameras of compatible resolution and protocol. NVR - a Network Video Recorder is for recording video streams over a network, i.e. those sent as data by an IP camera over a network cable. A NVR is only for use with network based cameras and will not accept analog or HD security cameras over coax. It is a common misconception that a NVR camera system requires an internet connection to transmit the signal from the IP camera to the NVR. As mentioned above in this guide, an IP camera system of 16 or less cameras is easy to setup thanks to PoE NVRs that create a plug-and-play internal network with compatible cameras. For systems requiring more than 16 cameras, all you need is a router and PoE switch to create a local area network (LAN) for a large scale deployment. If you are planning a system composed of only IP cameras, then a NVR is your recorder of choice. Otherwise, you will need a DVR for a hybrid camera system composed of coax and network cameras. Regardless, you can access CCTV Camera World's security camera recorders over the internet from anywhere in the world to watch recorded footage or watch images live as they’re happening in front of the camera’s lens. Even better, security alerts can automatically come to you. You can configure our DVR and NVR recorders to send motion activated push notifications to your smartphone or receive email alerts, providing you security assurance at all times. You can select recorders with a pre-installed hard drive that keep days, weeks, and even months worth of security footage. An important step in selecting the correct security camera for your use is knowing how much storage will be required to record video from the camera. Although the latest and greatest resolution security cameras are nice to have, knowing the correct hard drive size to buy with your DVR or NVR is vital to making sure ample days of recording are saved. The storage calculator located here is a simple and time saving tool to calculate how much hard drive storage space is needed for any of the security cameras we sell. With all this knowledge, it must feel like you're finally getting the hang of this. Yet, it is easy to lose sight of the bigger picture. Just going over these topics leads us to mention what are important expectations. A common expectation we’ve come across is how everyone wants a license plate capturing camera. That is ingenuity that not many cameras possess. Only license plate capture cameras can capture video with discernable detail from a license plate on a stationary or moving vehicle. Surveillance cameras for license plate capture are specialized cameras that have adjustable infrared strength and shutter rates that allow for the camera to see a plate without causing infrared reflection from the plate. While security cameras that have high resolutions sensors, such as 8MP or 12MP, can capture detail on a license plate, it is limited to daytime and only when the vehicle is still or moving less than 5mph. While moving, the license plate will be blurry when captured by a security camera. At night, a license plate may appear completely white due to IR glare caused by infrared LEDs meant for night vision on a security camera. While Smart IR on a camera is auto adjusting to give facial detail, it does not compensate IR LED intensity for license plate detail. Likewise, buying a cheaper system through a large retailer, like Amazon or Costco, can leave you with a system that cannot support all your needs. The picture will most likely not be what you’re looking for and you’ll still be paying a monthly fee to store the data over the cloud. 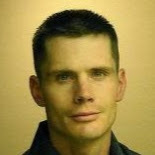 To further solidify this point, there is no single camera that can identify a face 150ft away, that has wireless capability, is solar powered, and has PTZ capability for $100 dollars. Unless you want to spend $500 or more per camera, a wireless system is out of the question. Although it might seem frivolous to say, we still receive inquiries asking for those exact specifications. It simply does not exist. That is why using this guide will help even the most novice customer understand not just what a security camera system can do, but also what can be expected of it as well. We’ve discussed important features of security cameras and the expectations you should have of them, but haven’t mentioned anything about price. Proper budgeting is the staple to all purchases that involve a level of planning. Estimate your expenses before looking to purchase a surveillance camera system. Be sure to research the type of cameras you need with product descriptions and video samples taken from the cameras you like. As a general rule, the higher the camera resolution, and the more advanced the settings are, the more pricey a camera becomes. You don’t need a 12MP or 8MP camera with a 32 channel NVR if you are just checking on your dog in the backyard. A 4 channel NVR with a few 2K IP cameras will do just fine. Capable safety can be cost effective, especially when purchasing a security camera system. After reading this article, you should now possess all the necessary knowledge for comparing security cameras. We’ve gone through types of security camera technologies, what questions to ask yourself, and limitations to be aware of. You can now gauge what is needed when choosing and designing a security system with your own specific needs.